I don’t know how I found this manga, oh wait I think all thanks must go to RedHawk. Even though I knew a one-shot of the manga was out a year or two ago I never actually got round to reading it. 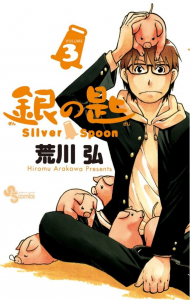 Anyone heard of Hiromu Arakawa-sensei Of course you have, even if your not familiar with her name you definitely have heard of Fullmetal Alchemist and now she’s brought out a new(ish) piece entitled Gin no Saji (Silver Spoon), so let’s check it out. 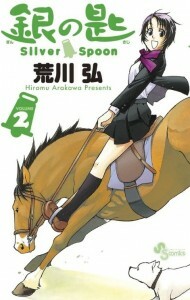 It’s definitely true that manga artists tend to switch genres for when they start new works, so it shouldn’t be too surprising that Arakawa-sensei decided to go from drawing a fantasy battle manga like Fullmetal Alchemist to her current, slice of life piece Silver Spoon mostly because she actually grew up in the country side. The thing I’m always wary about when considering to read slice of life manga is whether the story is actually capable of keeping me interested; it’s not particularly easy to come up with a plot that’s incredibly original with a set of characters that are likeable and artwork which enhances the reading experience appropriately. Even after the story, the characters and art are considered whether or not the manga will manage to gain any popularity is kind of hard to predict mainly because the shonen audience tends to prefer flashy battle/fantasy stories. It’s seems that just like Ohba and Obata-sensei (the creators of the current most popular slice of life Bakuman), Arakawa-sensei is truly amazing. It’s surprisingly informative. There’s a lot of vocabulary in the discussions and conversations that refer to different agricultural processes and the conversations themselves tend to be very technical. Obviously there is also a lot of humour arising from the dialogue sometimes being too complex (for the main character) but what’s even more surprising is that there a lot of discussions and conversations about issues such as animal cruelty, euthanasia of animals, vegetarianism etc. which go very well alongside the various scenes about food preparation and the agricultural processes. The artwork doesn’t even try to avoid the humorous slice of life style that you see a lot of in the more recent (i.e. past the first 40 odd chapters) chapters of Bakuman, but that’s not really a bad thing since it gives the story a completely light-hearted feeling to it. Of course there are moments when the artwork is more serious but most of the time you’ll be seeing humorous drawings. Besides these two factors, the characters and the overall direction of the story are what make this manga into a great read. If Bakuman were to be considered the best current shonen slice of life, Silver Spoon will be the one to replace it (Bakuman’s end can occur as early as this year). It’s a miracle for Weekly Shonen Sunday to have this piece running – it fits in rather well with the magazine as a whole, especially since their works don’t tend to sell on the level of Jump or Magazine. 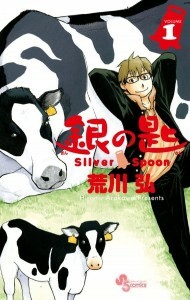 Silver Spoon is boasting an almost fictional sales figure of 1.5 million copies sold over just two volumes (volume 3 is to be released in Japan on April 18th) and on top of that has just snagged itself the Manga Taisho award. Though I haven’t read a properly translated version, an article on yahoo.jp has also mentioned talks about an anime, so we might be seeing Silver Spoon on our screens within the next year or two. If my feelings about the manga have not been made clear then this one statement should be enough to clarify: READ IT.